Yay for Kat as a stylist again! I told her how much I loved all the Kut from the Kloth pants I had so far, mentioned that I'm *still* always cold in Michigan, but I'd be thrilled to bring in some spring-ish looks to brighten things up. She delivered! When I said 'spring,' Kat heard me! Love this Rilo Button-Up Blouse from Collective Concepts. It's definitely sheer, and I'm wearing it hear with a coral colored camisole. I've since worn it with a grey camisole too and it showed up the print on the shirt a bit more. The sleeves can also cuff and button up to about elbow-length. I kept it and love it as a transition piece into spring. It's like my skin is still 'covered,' but light enough for warmer weather. I'm wearing the Rilo here with the Kate Boyfriend Jean from Kut from The Kloth. Completely love them! Probably not super flattering, but I don't look at that much. The fit is so comfy! My muffin is not squished in these bad boys. I did notice last time I did laundry that I apparently have removed them at least once without unbuttoning them. So they definitely are not tight. Since the rest of my old jeans are not this great, I find myself planning ahead to have these clean and ready to wear for special events. I kept them and want more just like them. This sweater is kind of magical. I will always wear it with my pearls, because it looks so business in the front, while there's a party in the back! Woo-hoo! This is the Chaley Split Back Pullover from Leo & Nicole. If I were 20 years younger, it may work without something underneath, but I'm not. The maroon camisole is my own. I've worn it with a lighter color camisole underneath as well. It is a pretty light knit and I'm sure I'll wear it into the summer. I kept it. I've heard marvelous things about 'dolman' tops for so long, I was excited to finally receive one in this fix. And wow. This thing is universally flattering! The snug fit at the waist is low enough to hold it all in place, without hugging anything I'd rather keep hidden. My only complaint is the wide neckline. Maybe it's just a pet peeve, but I really hate when my bra strap shows, and I'm of the build that I will never go without a bra. This is the Queensland Dolman Jersey Top from 41Hawthorn. 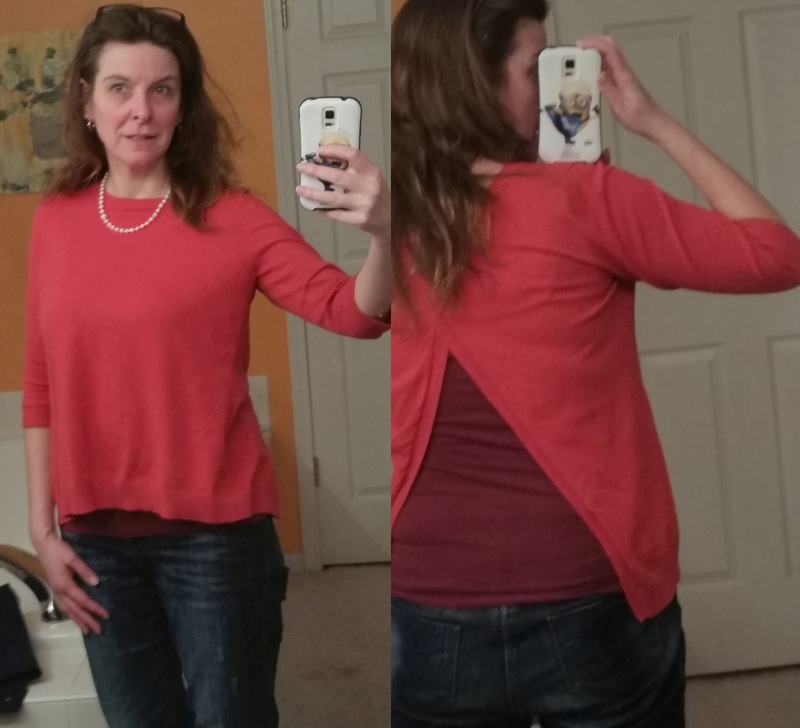 The jersey material is super soft, and the whole torso area of the shirt is super flattering. The sleeves also stay where I put them. I kept the shirt. I'm wearing it here with a pair of black skinny jeans. Last but not least, I received the Dobi Cargo Jacket from Laju. I love the canvas weight, and the super convenient chest pockets, as well as classic side pockets. I have plenty of room for my phone, reading glasses or sunglasses, and my keys. 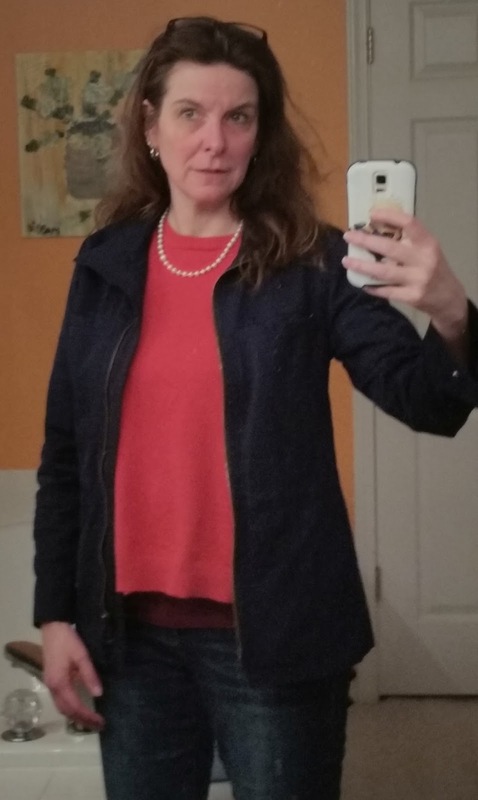 Personally, I could use a bit more length in the sleeves, but luckily I don't really wear a spring jacket for a lot of warmth. While I wouldn't have bought this off the rack (I do love sleeves that go all the way to my hands), I kept it and have already gotten a lot of wear out of it. Love them all! You are beautiful! 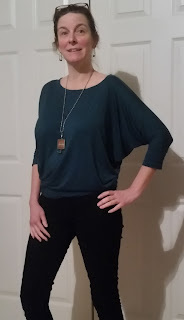 I like the Dolman top and the color! It looks good on you. These all look great on you. Great spring finds!